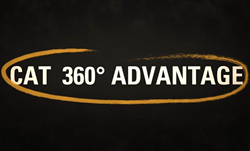 The Cat 360 Advantage opens up more possibilities for your business. Hawthorne Cat, the exclusive Cat® equipment dealer in San Diego, the Hawaiian Islands and the Pacific Region, announces the Cat 360° Advantage, a set of products and services designed to help you generate bigger returns and grow your business. Caterpillar listened to over 400 construction company owners and operators to identify support services and expert solutions that deliver the most value. Based on the responses, Hawthorne Cat created a set of offers that address specific business goals. The Cat 360° Advantage is designed to boost safety, productivity, and profitability. Cat 360° Advantage offerings include EMSolutions services, preventative maintenance kits, extended protection plans, financing options, parts availability guarantee, and fuel consumption guarantee. Choose three options and create a custom bundle when you purchase a qualifying new Cat machine. Eligible models include dozers, compactors, excavators, motor graders, track loaders, and wheel loaders. Visit the Hawthorne Cat website or call 800.437.4228 to learn more. Offer valid through June 30, 2017.